The global poultry feed market is expected to grow to $220 billion market by 2020. This will see a compound annual growth rate of 2.7 per cent from $182.5 billion in 2013. Globally poultry meat production is expected to increase from 95.7 million tons in 2011 to 124.6 million tons by 2017. This makes poultry the largest meat production segment in the global meat industry with it being universally consumed and, unlike beef and pork, devoid of any religious impact. The highest poultry production is expected in developing parts of the world such as China and Brazil because of rising living standards, production cost benefits, and strong export and domestic demand. The poultry industry in these countries also benefits from lenient feed related regulations. Healthy poultry requires sufficient quantity of proteins and carbohydrates along with the necessary vitamins and dietary minerals. These nutrients are added as feed additives. Poultry feed ingredients mainly comprise carbohydrates, proteins, and fats. Carbohydrates are the major source of energy and constitute the largest component of poultry diets, followed by plant proteins and animal protein sources. Feed additives are included in poultry feed to improve the efficiency of bird’s growth, their laying capacity, prevent diseases, and improve feed utilisation. Additives such as flavour enhancers, artificial and nutritive sweeteners, colours, and others are also added to the poultry feed to enhance quality. The growth in the poultry meat and egg industry and increasing demand for animal protein are the drivers pushing the market of poultry feed. Together with the growth in the global poultry feed market the additives - antibiotics, vitamins, antioxidants, amino acids, feed enzymes, and feed acidifiers - included in the feed are also expected to see growth in the coming years. Broilers dominated the global poultry feed market in 2012 with more than half of the market shares. The global poultry feed market is expected to generate revenues of $252,036.2 million and poultry feed additives is projected to generate $7,829.8 million by 2018 growing at a compound annual growth rate of 6.1 per cent and six per cent respectively by 2018. Globally, there has been an increased demand for animal protein especially poultry meat and eggs. The increase in the average level of income, population rise, and urbanization are some of the drivers triggering the demand for poultry products and ultimately the poultry feed and poultry additives. In North America, one of the leading global poultry producers and markets, the poultry feed and feed additive is estimated to grow from around $48,103.5 million and $1,702.6 million in 2013 to $66,238.4 million and $2,303.3 million by 2018, at a compound annual growth rate of 6.6 per cent & 6.2 per cent between 2013 and 2018. 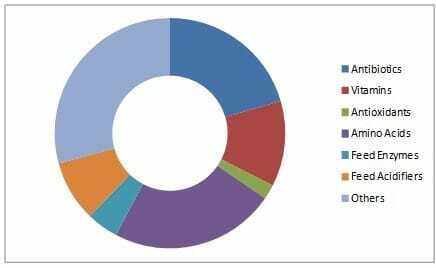 The poultry feed and feed additives market in North America is growing because of the increasing demand for meat products and North America is one of the largest consumers of poultry feed and feed additives. The market is mainly driven by high growth potential in the Mexican and Canadian markets, while the US market is focused on new, efficient, and safer animal poultry feed and feed additives. Research is also being carried out on flavoured poultry feeds in North America, which might improve the management of broilers and layers as the palatability and performance of birds is expected to improve with consumption of such feeds. The US is the leading consumer of poultry feed and feed additive in North America with a share of around 83.6 per cent and 85.1 per cent of the total revenue in 2013. 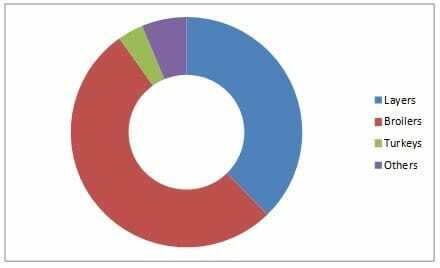 The broilers feeds segment has the largest market share in poultry feed while antibiotics segment has the largest share of poultry feed additives. The Asia-Pacific Poultry Feed Market was pegged at $69.9billion in 2013, but it is projected to reach $93.3billion by the end of 2018, with a compound annual growth rate of six per cent. The Asia-Pacific poultry feed market is broken down into broiler feed, layer feed, other poultry feed and turkey feed comprising 52.2 per cent, 37.7 per cent, 6.4 per cent, and 3.7 per cent respectively, of the global poultry feed market. One of the leading and growing players in this region is India, which, because it has a rich agro-technological advantage, has come a long way in using the poultry sector to the benefits of common masses along with earning ample foreign exchanges. The Indian poultry feed industry, which is dependent on the sound growth of poultry, is reported to have a great untapped potential, with southern part of India holding the maximum share of poultry production and consumption. Analysts anticipate the poultry feed market in India to grow at a compound annual growth rate of around eight per cent up to 2016-17 from 2012-2013. In coming years, the potential for packaged feed is expected to grow at a higher pace compared to traditional feed. Government initiatives to boost poultry production and more effective packaged feed have helped to boost the growth in the sector.